Provincetown has often been referred to as the birthplace of the modern American theater dating back to the creation of the Provincetown Players in 1915 and launching the career of Eugene O’Neill among many others. Today there is a rich and diverse program of theater throughout the year. 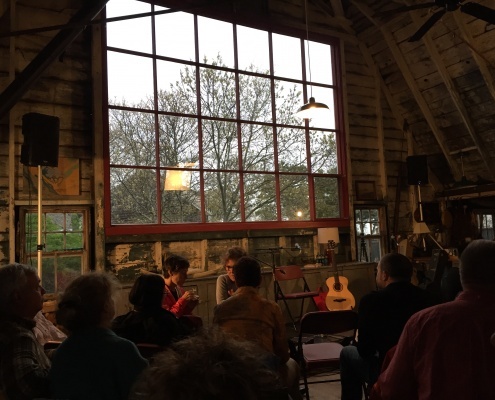 Located right up the street from us on Miller Hill Road in the historic Hawthorne Barn, Twenty Summers has a stimulating program of concerts and conversations in the spring each year. The Provincetown Theater is located just a few short blocks down Bradford Street from Aerie House and is the preeminent home of exciting theater treats. 2019 highlights include productions of August: Osage County and Sweeney Todd. Peregrine Theatre Ensemble will be producing Cabaret at Fisherman’s Hall this summer and their productions are not to be missed. Today Provincetown is also famous for a wide variety of performing artists who appear including drag queens, comics, musicians, Broadway stars and more. Both the Crown and Anchor complex and the Art House have multiple venues with a full schedule of top performers throughout the season. Be sure to catch our favorite, Miss Richfield 1981, at the Pilgrim House. Tin Pan Alley is another fun venue with a piano bar and nightly live entertainment almost every night in season. New for 2019 is The Club, a dinner club with live performers. This is in the spot of the former Pied Bar and is owned and operated by the entertainer Lea DeLaria. Provincetown has been a mecca for gay and lesbian visitors for decades and the fun-filled nights are a big part of the allure. The early evening starts at the Boatslip Resort for their world famous daily Tea-Dance. Enjoy dancing and drinks with your closest 1000 friends on their large deck overlooking the bay. Tea-Dance goes from 4:00pm to 7:00pm but the crowd doesn’t start to appear until 5:00 or 5:30pm. Either pre or post dinner we recommend our favorite bar, the Harbor Lounge, for a relaxing drink or two in their chill-out lounge overlooking the Ptown harbor. Barman Liam oversees a friendly establishment where both locals and visitors interact and have a great time up to their 11:00pm closing hour. Then dance the night away at either the Atlantic House, better known as the A-House, or the Crown and Anchor. Not into dancing, then there are many bars catering to every interest from drag to leather. Bars close early at 1:00am but for those still ready to party on, the local tradition is to congregate in front of Spiritus Pizza where the party continues.